Whenever I am in Paris, I always make some time to visit the grand Centre Pompidou. After four decades, the modern art museum with its inside-out construction is looking less cutting-edge, but it still boasts one of Europe’s best contemporary and modern art collections. However, it seems that I am not the typical Paris tourist. 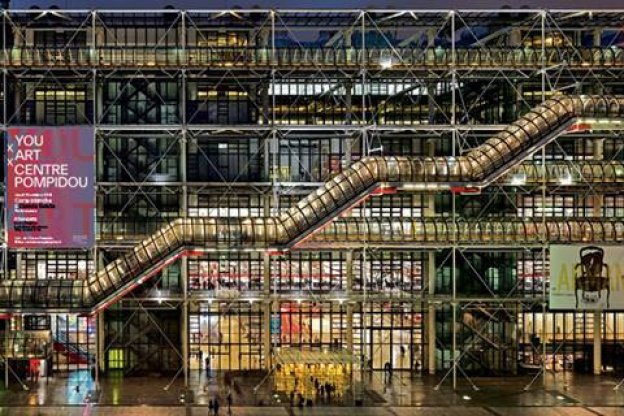 The Centre Pompidou has been experiencing an identity crisis since it can’t manage to compete with the city’s wildly popular and over-touristed sites, such as the Louvre and the Eiffel Tower. To counteract the drop in attendance, the museum has embarked on a novel PR campaign that just might boost its standing with visitors. This entry was posted in Architecture, Art, Europe, Museums, Public Transport, Tourism and tagged France, Paris, Pompidou Centre. Bookmark the permalink. That is a great piece of guerrilla marketing, really enjoyable to watch. be more insipid or downright effrontery. Please demolish this eyesore and use the alleged artwork for toasting marshmallows.